Yesterday we had our first ever hackathon here in the Adster office. It was an afternoon of brainstorming – fueled by pizza, brownies and ice cream. Initially, we thought we’d be able to complete the whole project in a four hour window, but in classic hackathon fashion, we grossly underestimated. While we might not be ready to unveil our creation, it was a great afternoon of team building and learning – and I’m excited to tell you guys about it! I found the hackathon to be a great teaching tool in more ways than one. Technical aspects aside, here are two other cool takeaways. It challenged us to improve our internal communication. 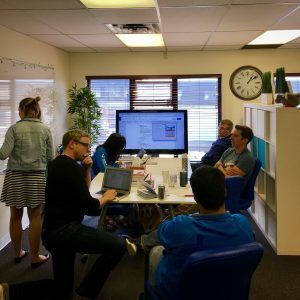 It’s not common for our entire team to be working together on the same project… at the same time. When seven people get together to work on one idea, opinions are bound to clash. Everyone prefers to digest information and work through processes slightly differently, so we had to adjust how we were passing information around to ensure that everyone felt heard and was on the same page. It allowed us to gain an appreciation for each team. The hackathon was a great reminder that we’ve got a bunch of smart people over here! We work hard, and we’re able to bring a wide variety of skills to the table. (Okay, I know that sounds real cheesy… but it’s true)! I won’t lie… I’m often guilty of assuming a development task is really easy when actually there is hours of work involved. I welcomed the reminder that it’s important to understand and appreciate how each team works and what their processes and timelines look like. So…..What Are We Working On? Wouldn’t you like to know!! While we aren’t quite ready to release our master tool, I can say that this tool is going to give users a quick recap of their website’s health. While not exhaustive by any means, this report will highlight important factors that will let you know if you should be chatting to someone about your SEO efforts. More details to come in the following months as we work to finish and publish our fun little project!